Discussion in '9/11' started by Mick West, Jan 3, 2013. 9/11 conspiracy theories are not going to go away, even though they have largely been debunked in quite some detail. There are always going to be people new to the theories who are simply no familiar with the rebuttals, or have rejected the rebuttals on spurious ground. Debunking is not about picking a "side" of an argument, and trying to argue for that side. It's about identifying and exposing bunk in the evidence surrounding that argument. If, for example, someone claims that a 767 could not fly above 500 knots, then you'd need to explain how it can. Debunking is about these individual pieces of evidence. The challenge to the debunker of 9/11 conspiracy theories is to find a way to communicate with the believer. Simply saying "you are wrong" is generally not going to work. Even explaining why they are wrong is probably not going to cut it. You really need to provide an alternate (genuine) explanation for something if you want them to actually realize they were wrong about something. And pretty much all the ground has been covered already, in excruciating detail. There are many sites dedicated to 9/11 debunking, and it's interesting to think about why they fail. Here I'll list some of the more useful sites that can be most effectively used to understand various things that happened on 9/11. Many of these sites reference each other, and it's a bit messy. I'll try to structure this page better over time. Much as I don't want to start comprehensive 9/11 specific site, if I can't find a well structured list, I'll try to do something here. I'm really hoping though that I'll be able simply to boil things down to a short list of go-to sites. I've added archive.is backups to the individual pages, and made local mirrors where possible. 911 Guide (http://archive.is/jcXn4) - One of the better structured sites - provides brief lists and descriptions of the various claims, with a brief explanation of the problems with the claims, and then links to more detailed discussions of those claims. WTC7Lies (http://archive.is/2wncY) - An excellent site, but a bit unstructured, and with many broken links. Debunking911.com (mirror)- a nice list of topics on the left, but articles are somewhat rambling and cover many points. 9/11 Myths, and the old site. Cover various things in depth and with good focus. AE911Truth.info - focusses on the claims of Architects and Engineers for 9/11 Truth. Popular Mechanics: Debunking the 9/11 Myths - Has a useful topic key at the bottom of the page for the major topics. Debunking the 9/11 No-Planes Theory - Debunks the more fringe theory that no planes hit the WTC towers. 9/11 Pentagon Attack Review - Very detailed look at all the evidence around Flight 77 hitting the Pentagon. This is a blog dedicated to all the engineers that have spoken out about what happend on 9/11 but were quotemined by the "truthmovement". Rather poor navigation, even if it does contain some useful info, it seems hard to find. ETA: It's a lot better if you expand all the dates on the right. Pity they did not just make a big list of all the articles. RKOwens4 youtube channel is a good one. Cjnewson88 has a nice collection of videos presenting a reconstruction of all flights, syncing with several available audios from the day, among other stuff. Coincidentally he just joined metabunk today. And a site linked at his videos descriptions, about AA77 and pentagon, has so much information that I never saw before. It's great. Can I start a thread on the topic of "squibs?" or puffs of concrete whatever you want to call it? You say these have been covered and it is "compressed air" what do you mean by compressed air? my argument is that these puffs or squibs prove that WTC was brought down using explosives. If you can debunk something, then start a thread and debunk it. Just focus. Of course, I expect the conspiracy theorists to say this was just the explosives which caused the high wind ("He even says explosions!") but they have no evidence of explosives. We do have evidence of pancaking. The ejecta coming out of the windows of the pancaking floor was uniform across the floor and light in color. It was coming out of every floor window until the falling debris obscured its view. Controlled demolition has staggered ejecta because the charges are only on some columns. You also always see at least [some] before the collapse and not [only] during it. There are none of these jets of debris before collapse. 9. Weren't the puffs of smoke that were seen, as the collapse of each WTC tower starts, evidence of controlled demolition explosions? No. As stated in Section 6.14.4 of NIST NCSTAR 1, the falling mass of the building compressed the air ahead of it—much like the action of a piston—forcing smoke and debris out the windows as the stories below failed sequentially. These puffs were observed at many locations as the towers collapsed. In all cases, they had the appearance of jets of gas being pushed from the building through windows or between columns on the mechanical floors. Such jets are expected since the air inside the building is compressed as the tower falls and must flow somewhere as the pressure builds. It is significant that similar “puffs” were observed numerous times on the fire floors in both towers prior to their collapses, perhaps due to falling walls or portions of a floor. Puffs from WTC 1 were even observed when WTC 2 was struck by the aircraft. These observations confirm that even minor overpressures were transmitted through the towers and forced smoke and debris from the building. Failure of the south wall in WTC 1 and east wall in WTC 2 caused the portion of the building above to tilt in the direction of the failed wall. The tilting was accompanied by a downward movement. The story immediately below the stories in which the columns failed was not able to arrest this initial movement as evidenced by videos from several vantage points. The structure below the level of collapse initiation offered minimal resistance to the falling building mass at and above the impact zone. The potential energy released by the downward movement of the large building mass far exceeded the capacity of the intact structure below to absorb that through energy of deformation. The falling mass of the building compressed the air ahead of it, much like the action of a piston, forcing material, such as smoke and debris, out the windows as seen in several videos. NIST found no corroborating evidence for alternative hypotheses suggesting that the WTC towers were brought down by controlled demolition using explosives planted prior to September 11, 2001. NIST also did not find any evidence that missiles were fired at or hit the towers. Instead, photographs and videos from several angles clearly show that the collapse initiated at the fire and impact floors and that the collapse progressed from the initiating floors downward, until the dust clouds obscured the view. Puffs from WTC 1 were even observed when WTC 2 was struck by the aircraft. These observations confirm that even minor overpressures were transmitted through the towers and forced smoke and debris from the building. Very quick news from Brazil. If ice can do that to an airplane, can you imagine what a whole building can do? Yes. Shatter it into fragments. Isn't the question "What can a fast airplane do to a building?" The energy involved (KE) = 0.5*M*V^2, where M = 180,000 Kg (the weight of a Boeing 767-300ER) and V = 250 m/sec, and is therefore 563 billion Joules, or equivalent to 1.35 tons of TNT. You have to imagine that NONE of that energy goes anywhere else (because it cannot). Now imagine. The problem is that both ways are disputed by CTers. - Why didn't the strong airplane "bounced"? 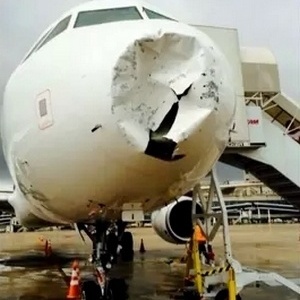 - Why did the weak airplane damage the building? My picture (together with hundreds of other examples) shows that the airplane is weak. What my be difficult to explain is that both structures are very strong, and when two strong structures collide, both will sustain damage. Yes....but a radome (IN the sense of commercial airliners) is not constructed of aluminium. It is a composite of various materials that are 'transparent' to radio signals...or "RADAR"). MASS 'plus' VELOCITY = 'ENERGY'. (I might not be "understood" here....but think of a "missile".....HIGH ENERGY, with explosives on-board. Of course, the only "explosives" available on a commercial airliner were the Jet-Fuel....). What may be difficult to explain is that both structures are very strong, and when two strong structures collide, both will sustain damage. I had previously written (KE) = 0.5*M*V^2. The V squared has enormous implications. It is why depleted uranium flechettes need no explosives. The energy of the impact must have been shared equally by both plane and tower, and with 5/16" thick sheet steel box sections and four inch floors to fight, the aircraft lost the battle. Initially at least. Someone, maybe here, has calculated the KE lost as the plane entered as 2.5% of the total. I think that signifies easy entry without any risk of bouncing off. I think this needs to be further explained, to the "on-line audience". To use the term "depleted uranium flechettes"? Most readers might not understand (and I KNOW!!!! I write stuff here, and forget that there is a VERY large audience of readers who aren't cognizant of the technical points or scientific specifics!! ....OF what I type!). From what I understand...."depleted uranium", or "DU" is a VERY dense metal....after it is no longer radioactive (or maybe it still is??) BUT is a VERY effective, high-density metal to use at the tip of a warhead (or missile)? Am I close to the truth, here?? Yes, but not here, I think. What that picture fails to illustrate is what happened to the hailstones. They of course were shattered into dust or even melted by the energy of impact. Both radome and hailstone "lost". What it does illustrate well is that only those areas actually contacting anything will suffer damage. Now Note that most of the exterior wall of the towers are windows. Energy goes into the columns that get hit. A first order calc then would be to note the mass of aircraft, aluminum, fuel, possible engine and wheel assemblies, etc., through a section of the aircraft in line with a column. A column of x width then will be impacted by a mass of aircraft through a x wide section of the plane. If the energy contained in that section is greater than the energy required to snap the column then the column will snap. Think of a bullet, soft lead, traveling at mach 1 or so. It contacts a hard steel plate and contains enough energy to punch right through it creating a hole the same as the cross section area of the bullet. If the steel were a rod of less width than that of the bullet then the rod would be snapped through and the bullet would become two, or more, separate pieces. Would anyone expect the pieces of that bullet to be robbed of all forward velocity by being cut in half on contact with that rod? Back to aircraft. Now we note that the contact with columns is tearing the plane into pieces. Those parts that hit glass we can treat as if they lose next to no momentum and enter the building at similar velocity as they were a split second before contact. The parts that hit column, if they contain enough energy to punch through a column, will continue into the building with a velocity that is dependant upon whatever energy was in excess of what was required to snap through the column. THE ONLY pieces that will, or can, simply stop at the perimeter, are those that have less energy than required to snap through a column. Same goes for that bullet I wrote of. Slow it down and it will mash on the steel plate, maybe dimple it. Slow it down sufficiently and hit a steel rod and the bullet will mash against the rod too. Note that CT's often speciously describe a jetliner as a hollow thinly sheeted, aluminum tube. That's extremely inaccurate of course. It weighs 100+ tons so of course the first thing to note is that the wheels and wheel assemblies must be able to support that weight. Of course it has to land so it had better be able to withstand vertical and horizontal forces involved in decelerating that mass as well. Second, the engines must be made of materials strong enough to withstand the forces involved in accelerating that mass from zero to take off velocity in a few seconds. At that point the wings must be constructed strongly enough to also support the entire weight of the aircraft and forces generated in changing its altitude and direction. What of that actually 'tube'? Well, it must be strong enough to support you and around 100 other people, your luggage, the seats you sit in, the hydraulic machinery etc. Sure its a thin aluminum tube. MANY years ago I read an article in a science-based periodical (Modern Science, Popular Science, Scientific American, etc. but I don't remember exactly which one) which went into great detail (more so than the Popular Mechanics article) regarding, rather specifically, how the physical construction of the WTC actually aided in it's collapse.. It described WTC 1 & 2 as (internally) resembling a box of Saltine crackers, basically an outer shell containing 4, separate, internal "stacks" of floors with the individual crackers representing the floors themselves.. Those floors, it said, were attached to both the outer shell & the central (steel) columns with L-shaped ALUMINIUM brackets (melt point @ 1221 Fahrenheit).. And it was the heat-softening, and subsequent failure, of these brackets which caused the pancaking effect.. Perhaps someone with better web-search skills than I could find this article and link it here..
...Those floors, it said, were attached to both the outer shell & the central (steel) columns with L-shaped ALUMINIUM brackets (melt point @ 1221 Fahrenheit).. And it was the heat-softening, and subsequent failure, of these brackets which caused the pancaking effect.. Perhaps someone with better web-search skills than I could find this article and link it here.. This is not true, the floor joist seats were STEEL welded to the perimeter and and core structures. I doubt that a decently researched documentary would make such a claim and suspect that you perhaps misremember. If it did, then it's not a good resource. I have no idea what article you are refering to, but I like the idea of floors as crackers. Is this site for debunking 911 only? . . . in that you are only interested in articles or facts that help do that? For example, if something were to jar your thinking so that you began to see some truth in the fact that the buildings might have been demolished, would those facts be allowed here? please read the posting guidelines. Metabunk debunks bunk. We dont care where the bunk comes from. Bunk is bunk. as far as your question, which is off topic, you can start a new thread any time you would like. Following the posting guidelines. At Metabunk we examine specific claims of evidence. Conjecture, speculations or threads that try to argue a point simply by "this doesnt look right to me" claims, will be thrown into Rambles. Evidence of the claim must be provided. If you have evidence of a specific claim you may start a new thread. Slide #7... really good stuff! You need to manage your "Conflict of Interest"
I think less likely WTC 1/2 as I do not recall they ever having heavy fire at near ground level. The area is also littered with papers which suggests after at least one tower has fallen. Given the relatively relaxed onlookers, I would think its between 1 and 2 collapsing. Frankly, looks more like #5, maybe #3, not sure from what direction though. my headache soothed thanks to all , bld 5 or 6 explains why i had no seen or recognized it prior as not much mentioned about these. Just thought I'd post this video which includes footage of WTC 7's south face as the face is being hit with debris, as well as it's side and top. Pretty interesting and not sure many have seen this. I attached a small gif of the particularly rare shot. I once saw somewhere two other studies that were done on building 7 that are not the NIST report. There were links to them and I read some of one of them. Now I can't find these anywhere. Anyone know of these studies and possibly have the links? Thanks! You can find the expert reports prepared by the plaintiffs in the Aegis Insurance litigation here, and you can find a report prepared by the defendants' expert witnesses here. The latter was never filed with the court for procedural reasons but has been independently republished by its principal author. There are also at least two textbooks on disproportionate collapse that I've come across that discuss the collapse of World Trade Center 7 at length. You can find them here and here. only just woken up, but i think your figure of 1.35 tons of t.n.t. is out by a factor of at least 100. 1 ton t.n.t.= about 4,000,000,000 joules, cant find my calculator but around 135 tons of t.n.t. I used 116,000 kg instead of 180,000 kg, and 243 m/s instead of 250 m/s. AA11 was slower. One kg of TNT is 4.18 MJ - I thus get 3420 MJ / (4.18 MJ/kg) = 818 kg of TNT. Less than a ton. thanks, i used jazzies 563 billion joules , wildly out, but he got the 1.3 tons right, according to his weight and speed.